Just how long will it take for the body-con hordes to descend on the Duchess of Cambridge? “I hope Kate’s lost her baby weight by now. I mean, it has been four hours now, you know,” quipped Hadley Freeman on Twitter yesterday. “Anyone know if she’s back in her skinny jeans?” Joking aside, the royal baby bump and other physical manifestations of Middleton’s pregnancy (who knew hyperemesis gravidarum would be a top topic for 2013?) have been scrutinized incessantly ever since the pregnancy was made public. But baby-body talk—especially when it comes to the Hanoverians and the Windsors and the like—hasn’t always been so forthright. Conversations surrounding royal pregnancies have mostly been a matter of indirection. Of course, this isn’t surprising, given that the word “pregnant” remained taboo until the 1950s, according to the Online Etymological Dictionary. Dainty euphemisms included “in a family way” or “with child.” (There were some cruder alternatives: Eighteenth-century slang used the non-euphemistic “poisoned” to connote the condition. According to A Dictionary of Slang and Unconventional English, “in the spud line” was at one point an alternative.) In 1857, when Queen Victoria gave birth to her youngest child, the official announcement was careful to avoid any unseemly agency with tactical deployment of the passive voice. “This afternoon, at a quarter before two o’clock, the Queen was safely delivered of a Princess …” read the official announcement. Indeed, it might be modern visual culture that’s done the most to fuel baby-bump obsession and propel it to some grotesque levels. “Kate Really Shows Off her Baby Bump At Last!” exclaimed The Daily Beast in April, eagerly noting that she finally looked “properly preggers.” Kim-v.-Kate pregnant-body comparisons formed a mini genre within celebrity magazines for a large part of the spring. New York magazine has prominently featured a Kate Middleton Look Book on the Cut for months. 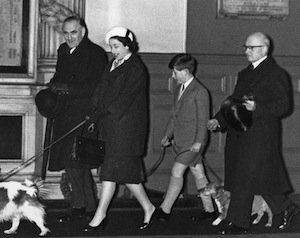 The as-yet unnamed HRH Cambridge may be a comforting symbol linking past and present but there’s little in today’s discussion of the royal bodies that would be recognizable to their esteemed ancestors.